During ingest, digital objects are packaged into SIPs and run through several microservices, including normalization, packaging into an AIP and generation of a DIP. The single SIP will move through a number of microservices. If you have preconfigured Archivematica to do so, processing will stop at a decision point that allows you to choose a file identification method to base normalization upon or to choose to use pre-existing data gathered during identification at the transfer stage. 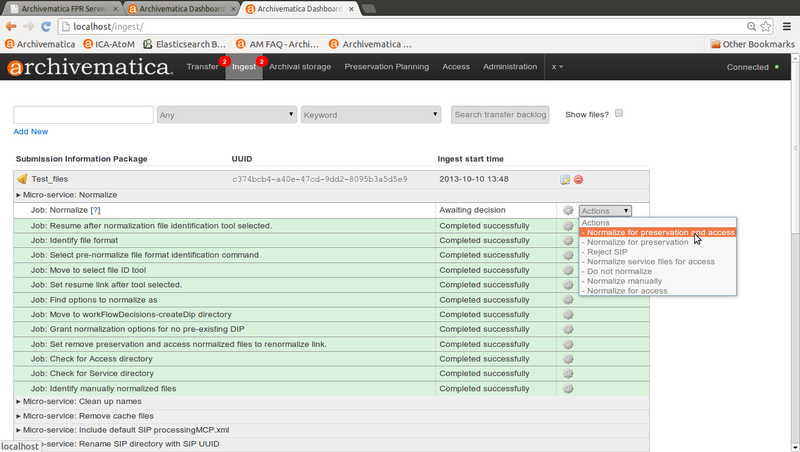 Archivematica default is to use pre-existing data. 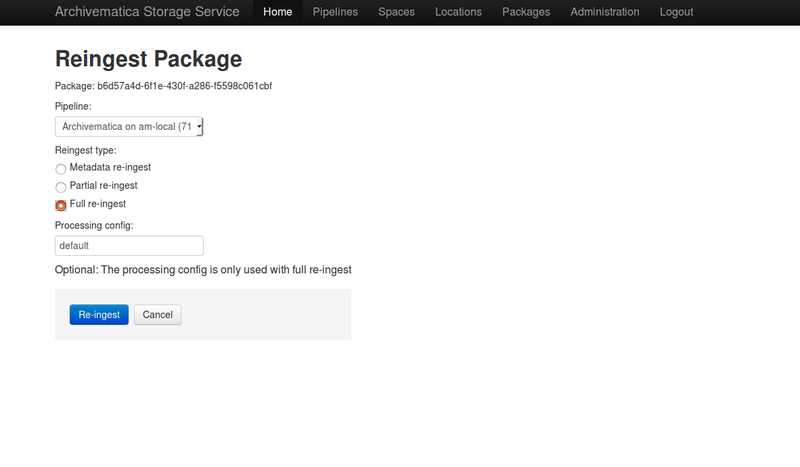 For more about this option, see Processing configuration. Click on the directory in the Arrange pane to select, and then click Create SIP. Archivematica will confirm that you wish to create a SIP from the selected objects and then proceed through the ingest microservices. 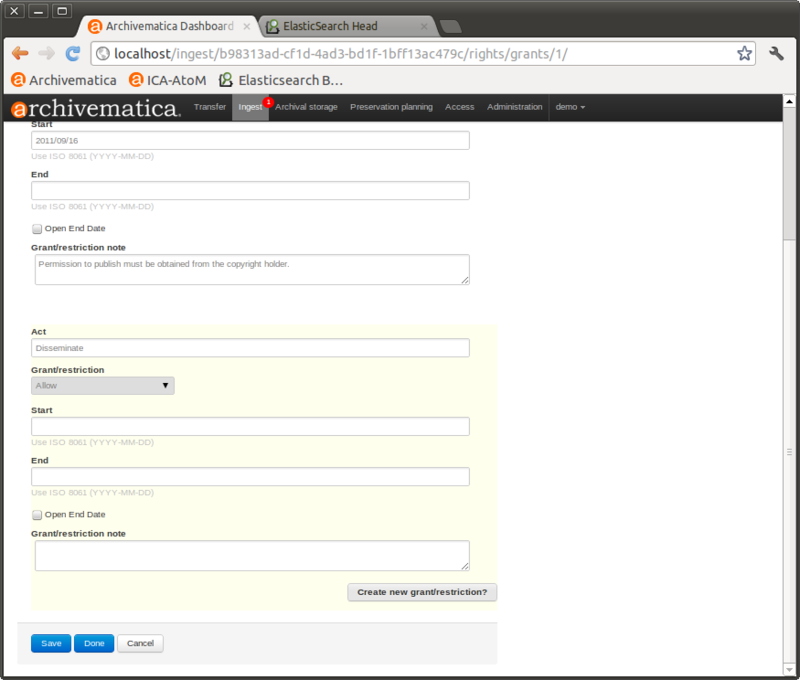 Archivematica can accept descriptive metadata about your digital objects. 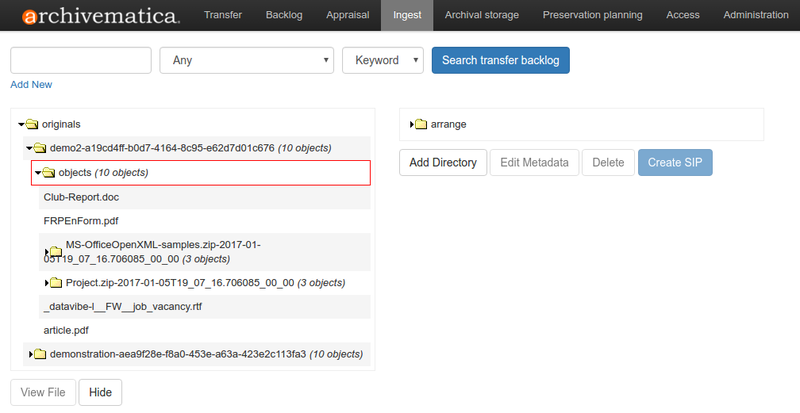 For information on including descriptive metadata prior to starting your transfer, see Transfers with descriptive and/or rights metadata. 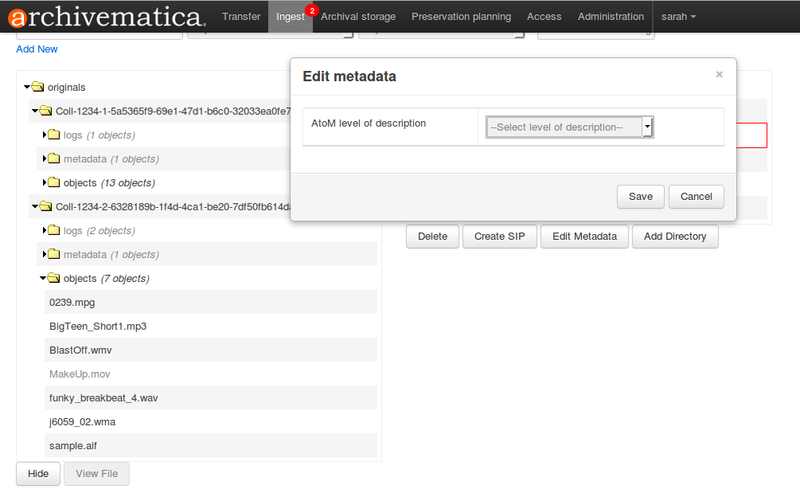 This section will describe how to add descriptive metadata to your materials once processing has begun in Archivematica. 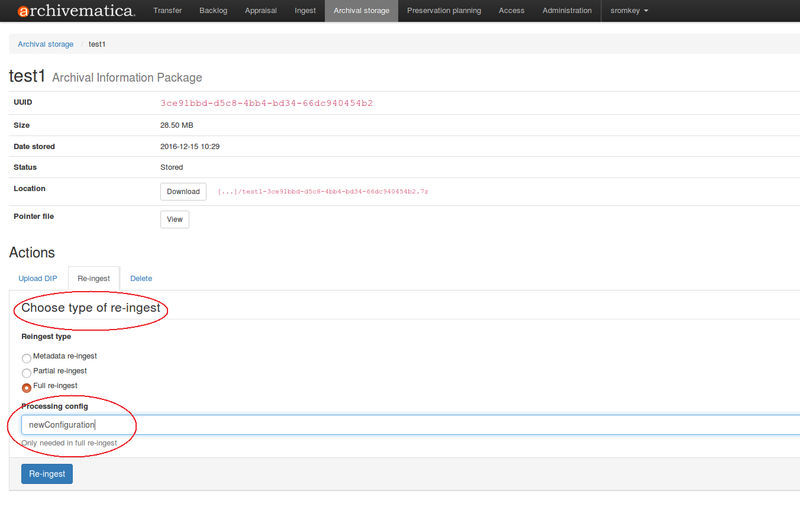 Archivematica can be configured to prompt you with a reminder to add metadata by setting the processing configuration field Reminder: add metadata if desired to None. This reminder occurs at the last moment that it is possible to add metadata; once the ingest proceeds past this point, it is no longer possible to add metadata to the SIP. There are two methods for adding metadata while materials are being processed: by entering it into a form or by uploading a CSV file. If you are planning to pass descriptive metadata to AtoM, see AtoM Dublin Core for information about the Dublin Core elements available. This method is best for users who are creating transfer-level metadata at the time of processing, or who don’t wish to do the extra work to prepare a CSV to upload metadata to Archivematica. The metadata form implements the Dublin Core Metadata Element Set. Note that this method only allows you to add descriptive metadata to the transfer as a whole. To add metadata on a per-item basis, you must import metadata using a CSV file and either include the CSV with your transfer before transfer or upload the CSV through the user interface. You must carry out the following steps before the microservice Reminder: add metadata if desired is completed. After this point, any metadata that is entered will not be properly attached to the SIP or entered into the METS. While on the Transfer or Ingest tab, click on the metadata template icon to the right of the transfer name. This will take you to the SIP detail page. Under the Metadata heading, click Add. Add metadata as desired and save it by clicking Create at the bottom of the screen. Clicking and hovering over a field will show a tooltip that defines element and provide a link to the Dublin Core Metadata Element Set. 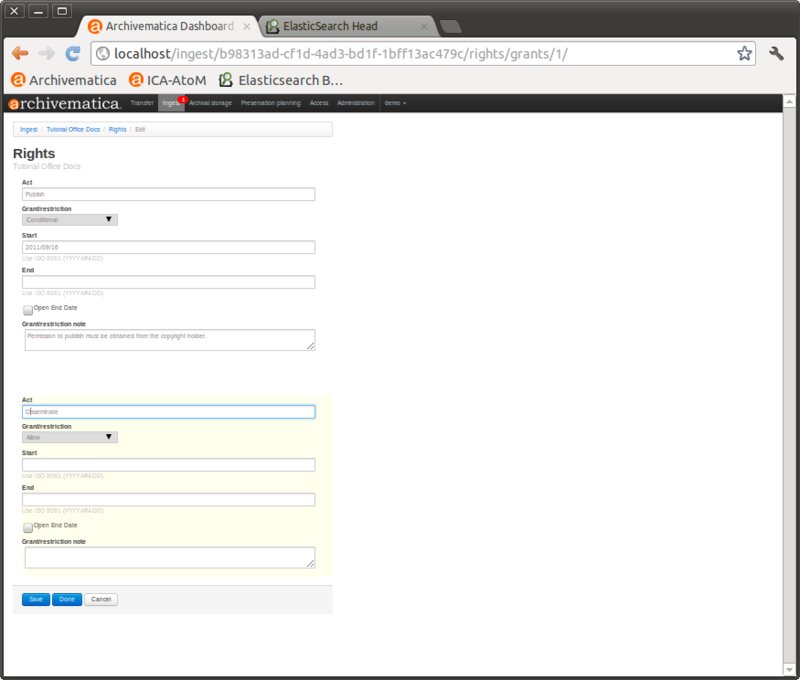 When you click Create, you will see the metadata entry in the list page. To edit it further, click Edit on the right-hand side. To delete it, click Delete. To add more descriptive metadata, click the Add button below the list. Return to the Transfer or Ingest tab to continue processing the SIP. Descriptive metadata CSV files are ideal if you are creating hierarchical metadata, want to apply metadata to individual objects, or if you want to use metadata fields other than those available in the Dublin Core Metadata Element Set. In order to upload a CSV file, it must be available in a transfer source location connected to Archivematica, the same way that digital objects are made available. For more information about transfer source locations, see Transfer source locations. 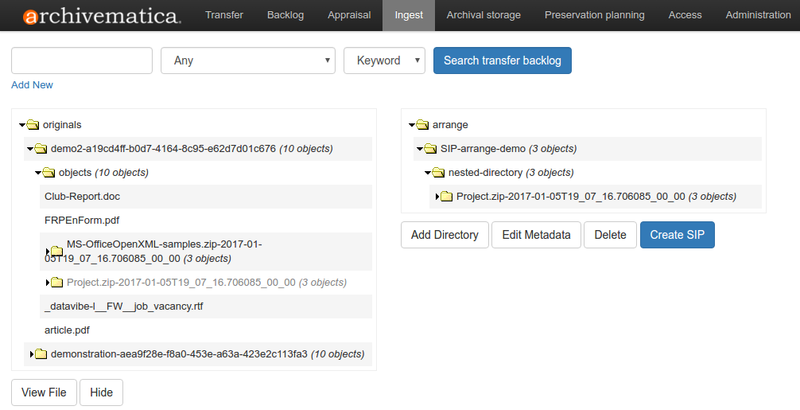 For more information about importing metadata into Archivematica, including how to structure metadata CSV files, see Import metadata. You must carry out the following steps before the microservice Reminder: add metadata if desired. After this point, any metadata that is entered will not be properly attached to the SIP or entered into the METS. 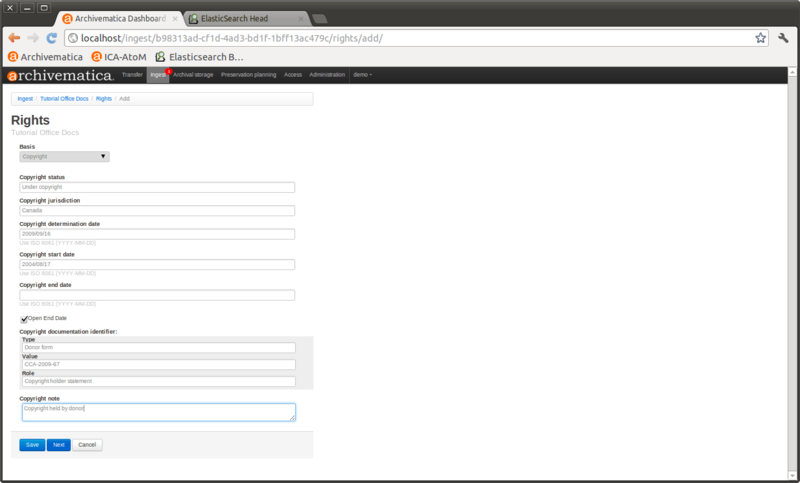 While on the Ingest tab, click on the metadata template icon to the right of the transfer name. This will take you to the SIP detail page. Under the Metadata heading, click Add metadata files. Select a transfer source location and click Browse. 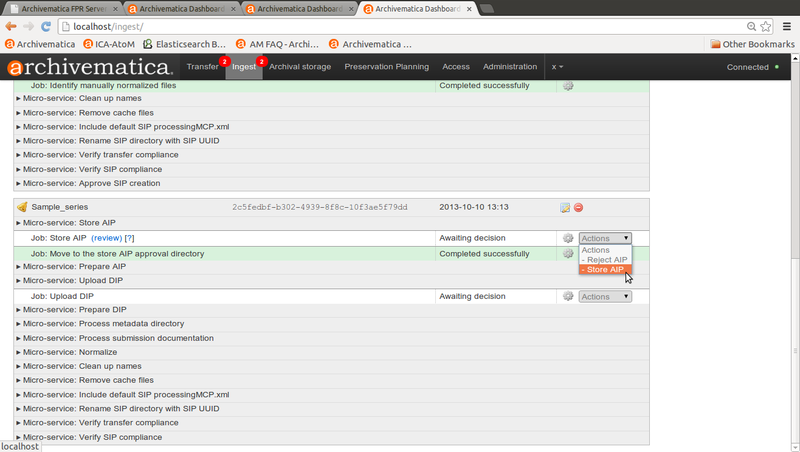 Navigate through the folders to find your CSV file. Once you have located the CSV file, click Add to the right of the file name. Repeat as needed. Once you’ve added all of your files, click Add files. A spinning wheel will indicate that the file is being uploaded. Once it disappears, return to the Ingest tab to continue processing the SIP. 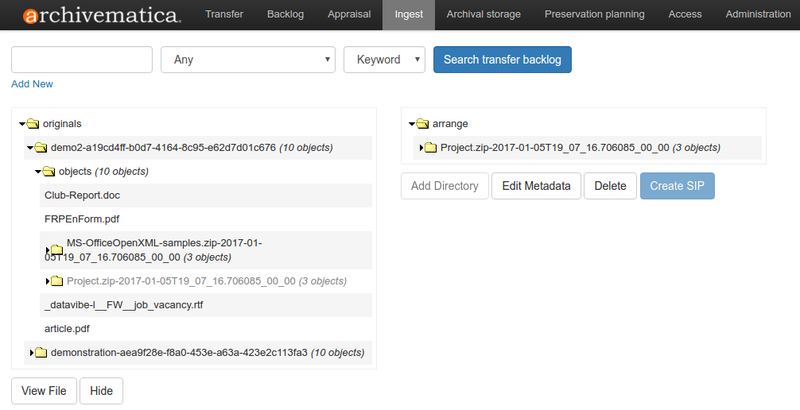 Archivematica can accept PREMIS rights metadata about your digital objects and parse this information into the METS file. For information on including rights metadata prior to starting your transfer, see Transfers with descriptive and/or rights metadata. 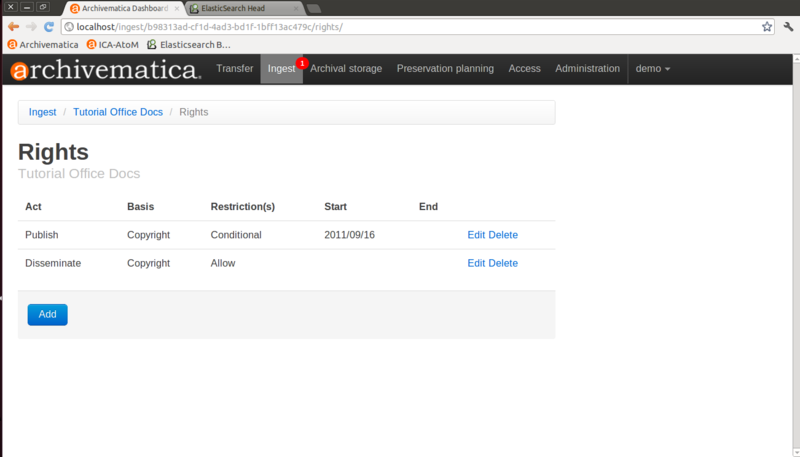 This section will describe how to add rights metadata to your materials once processing has begun in Archivematica. The rights form consists of two pages: one for the rights basis, and another for acts. For more information about Archivematica’s PREMIS rights implementation, see PREMIS template. To add rights, click on the template icon. Add the rights basis information and save the data by clicking the Save button at the bottom of the screen, or click Next if you are finished and ready to move on to the second page of data entry. Enter act information and the associated grants/restrictions and save the data by clicking Save. When you click Save on the acts page, you will be given the option to add another act and further grants/restrictions. Once you have finished adding acts, click Done. You will see the rights entry in the list page. You can add more rights by clicking Add again, or edit or delete existing rights from this page. Normalize service files preservation - see see Transferring material with service (mezzanine) files for more information. The report shows what has been normalized and what is already in an acceptable preservation and access format. 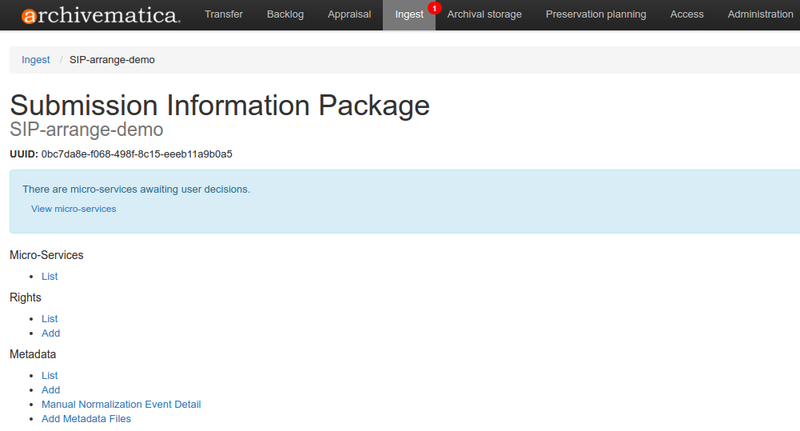 Archivematica gives users the option to Transcribe SIP contents using Tesseract OCR tool. If Yes is selected by the user during this microservice, an OCR file will be included in the DIP and stored in the AIP. After normalization is approved, the SIP runs through a number of microservices, including processing of the submission documentation, generation of the METS file, indexing, generation of the DIP and packaging of the AIP. If desired, review the contents of the AIP in another tab by clicking on Review. You can download the AIP at this stage by clicking on it. 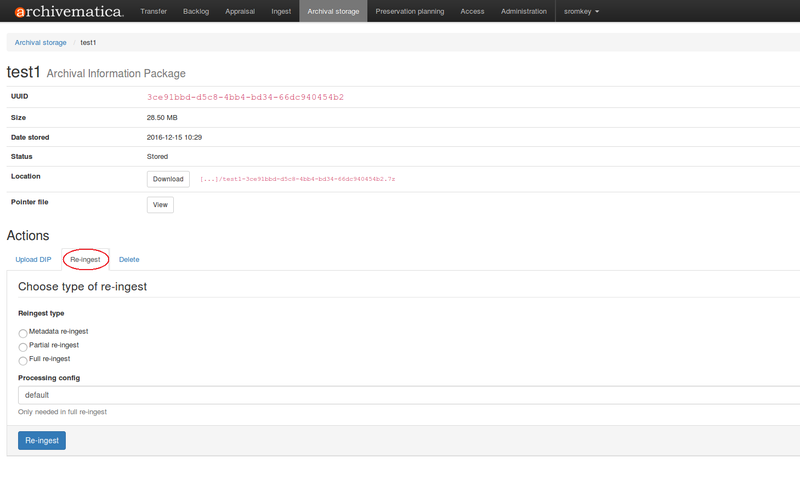 You can also view and validate the METS file by clicking on the temporary file that ends in “validatorTester.html”. Click on this file will open the METS XML in a new window and allow you to validate the document against the METS specification. More information on Archivematica’s AIP structure and the METS/PREMIS file is available in the Archivematica documentation: see AIP structure. This method is for institutions who want to be able to run all the major microservices (including re-normalization for preservation if desired). A possible use case for full re-ingest might be that after a time new file characterization or validation tools have been developed and integrated with a future version of Archivematica. Running the microservices with these updated tools will result in a updated and better AIP. At the Normalization microservice you will make different choices depending on the type of AIP re-ingest you’ve selected.